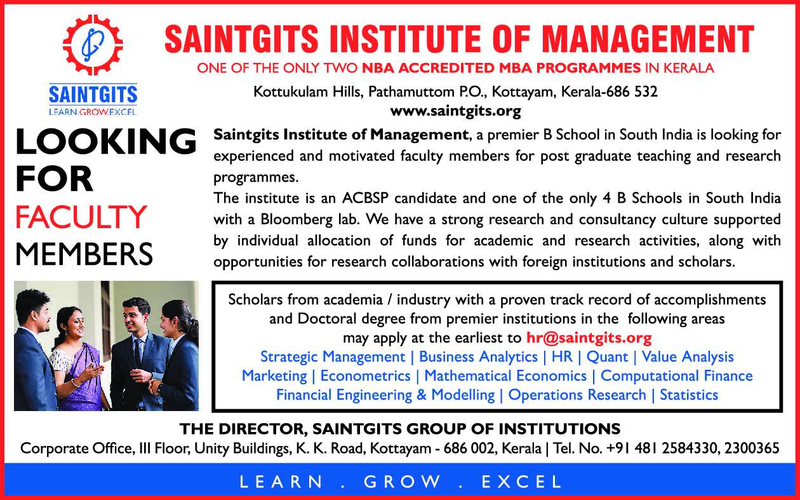 Saintgits Institute of Management, Kottayam has advertised in THE HINDU newspaper for recruitment of Non-Teaching Faculty- Professor / Associate Professor / Assistant Professor jobs vacancies. Interested and eligible job aspirants are requested to apply immediately from 27th March 2019. Check out further more details below. 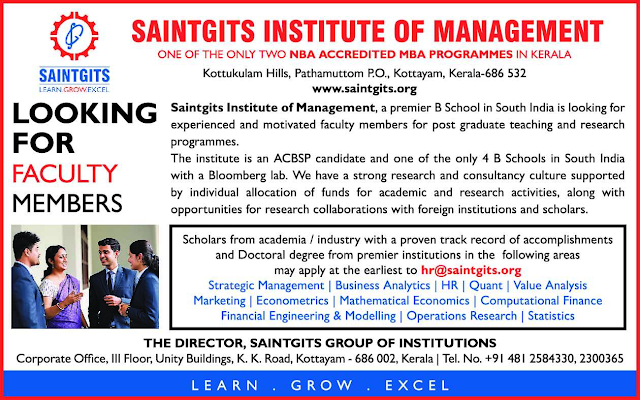 About College: Saintgits Institute of Management (SIM) is a research focused Business School affiliated to Mahatma Gandhi University, Kottayam and recognized by All India Council for Technical Education, under the aegis of Saintgits College of Engineering. The mission of SIM is reflected in our motto—'Dare to Innovate and Learn to Execute'—and since its inception in 2006 SIM has stayed true to its mission and made significant contributions to its students and society. How to Apply: Interested and eligible candidates are requested to send CV along with copies of certificates, copy of PAN card, copy of Aadhaar card and PP size photos to the email address or postal address given below.